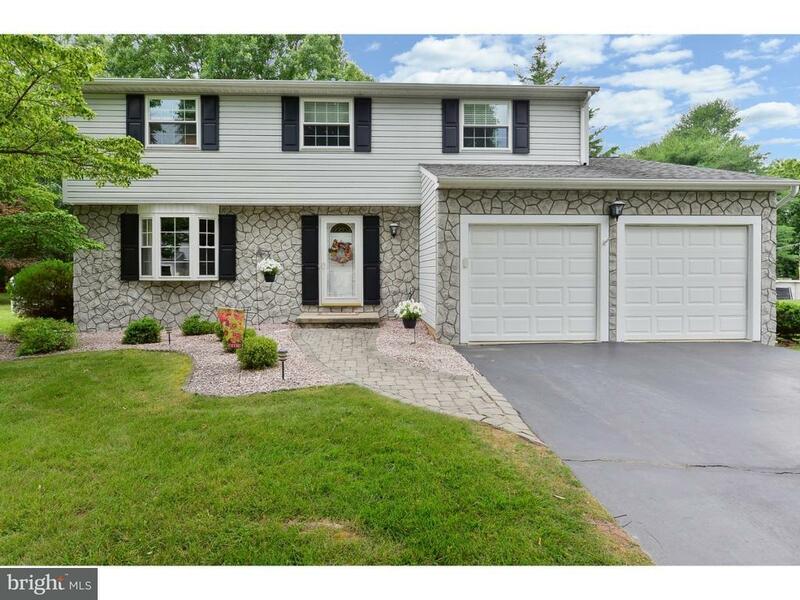 This lovely, two story traditional home is beautifully maintained, has great curb appeal, and is sited on a beautiful lot. Lots of lush lawn area surrounds this home, and the fenced rear yard provides you with plenty of space for the pets and family to play. You will notice a storage shed that offers the perfect place to store whatever you need. The backyard also has a custom Trex, tiered deck along with an adjacent patio area. There is plenty of room for outdoor furniture arrangement for entertaining, dining, and casual conversation. The interior of this home has great flow from room to room. Plush, off-white carpet extends through the Living and Dining Rooms which also have freshly painted walls in designer colors. These walls are all accented by white painted wood trims that include chair railings and crown moldings. The windows are newer throughout the house, and the floor floor includes a beautiful bay window for lots of light in the Living Room. The Dining Room also has double casement windows that provide ample light. Everyone will enjoy gathering in the well designed Kitchen with lots of oak cabinets, granite countertops, and hardwood flooring that extends from the foyer throughout the Kitchen area. Theres a casual dining counter with open access to the Family Room area. This allows for an interactive experience for the family and guests as meals are prepared and everyone relaxes in the Great Room. This area also has newer casement windows plus a newer French Door that provides access to the deck. The Powder Room has been fully upgraded with a furniture style vanity and new fixtures. Your upper sleeping level includes a generous Master Bedroom with dressing/vanity area and a large, walk in closet. The Owners Suite also has an all updated bathroom with new vanity and tiled floor. The remaining 3 bedrooms have ample closets and share an all upscale full bath with new vanity, decorative framed mirror, and a tub/shower. Once again, youll find newer windows throughout this upper level. There is a full, unfinished basement for storage or for you to decide how to use. Your laundry is located here. All of this plus a new hot water heater (just 2 years young). This is a home that you can begin to enjoy from the moment you put the keys in the front door. See this one today, as homes as nice as this dont last long in this hot, summer market.